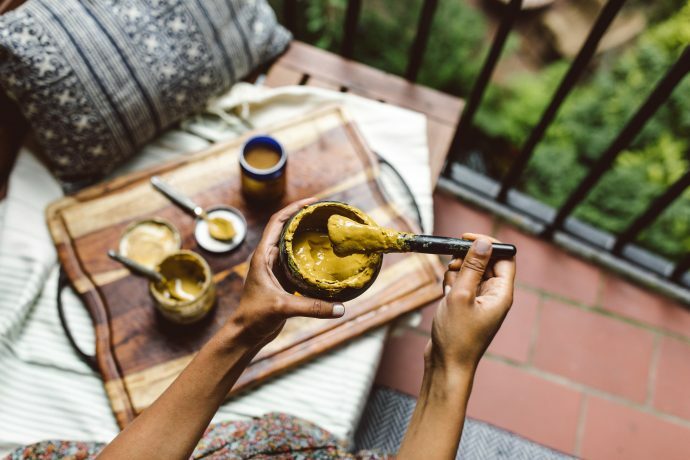 WHAT’S THE GOOP-IEST THING NOORA RAJ BROWN, THE VP OF COMMUNICATIONS OF LIFESTYLE/WELLNESS ONLINE MECCA GOOP HAS EVER DONE? “Well this is pretty Goop-y,” Brown admits of her current activity. 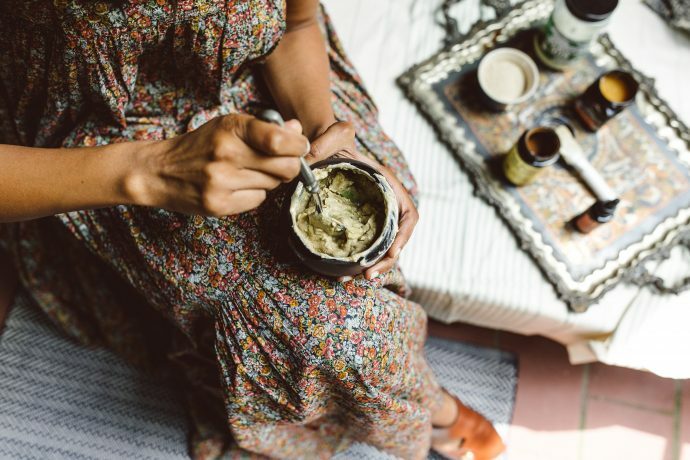 To be fair, Brown is barefoot in her airy West Village kitchen, clad in a bohemian vintage Cacharel frock and whipping us up two homemade masks made with ingredients ranging from Ashwagandha to Mayan Clay excavated straight from Tulum. Yup, we’d say that’s pretty Goop-y (and pretty Bonberi, now that we mention it). After test-driving her covetable masks (she needs to sell these ASAP! 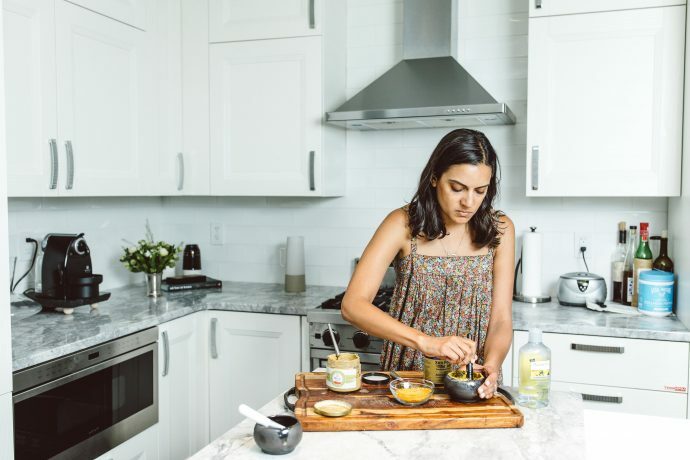 ), we caught up with the Cali-native who talked the multiple virtues of turmeric, her extensive self-care regime and how to get spiced okra just right. How would you describe your philosophy when it comes to nourishing yourself, inside and out? It sounds cliché, but it’s all about balance and what comes easily to you. I have a weakness for bread and cheese on vacation, but I also love sashimi, leafy greens and hot yoga, so I try to treat it like a seesaw and indulge in the healthy habits I actually enjoy. If I feel like I’ve been drinking a lot of wine (which, especially in summer, is a frequent occurrence), I’ll go into repair mode: I’ll eat super clean, do a lot of yoga and get a ton of sleep until I feel like myself again. What are in these masks you are making us? There’s one with this Mayan clay mud. I add turmeric, ashwagandha and a little bit of witch hazel. It’s a super clarifying one. It helps with the texture of my skin. When it’s not a pimple but it’s not quite where it should be. I found it really helps. I do it pretty much every week. The other is a moisturizing mask of yoghurt, honey and avocado. When would you use this moisturizing mask? I fly a lot for work and I also happen to have pretty dry skin so I need a lot of moisture. But especially when I come home from a long trip. This is usually when I’ll make something like this, light a candle, read a really good book and have that me moment. Where is this clay from? This clay is actually amazing. It’s from this place called Mayan Clay Spa in Tulum. It’s very similar to Aztec clay. They literally cover you head to toe in clay, including your hair. You walk out and your hair is basically sticking straight up. Then they take you into the ocean and bathe you naked. It’s the best place ever. Do you use the clay for other things? I use this for everything. If I think I’m going to break out, I’ll use it. If I have a bad sunburn, I’ll use it. It’s healing. I really believe it works for everything. I probably use it for more than you’re supposed to, but I just throw it on. What do you use to mix your masks in? May Lindstrom bowls and brushes, which are my favorite thing in the whole world. It’s just nice to have a ritual. What’s one essential oil you love to use in your masks? Sandalwood. There’s eight million different benefits, but my mom always says, “It opens your soul.” When I was little, I would use it when I wasn’t feeling well. You can put a few drops into any oil you want–a floral oil, coconut oil, olive, any sort of good base. It’s extremely relaxing and de-stress. 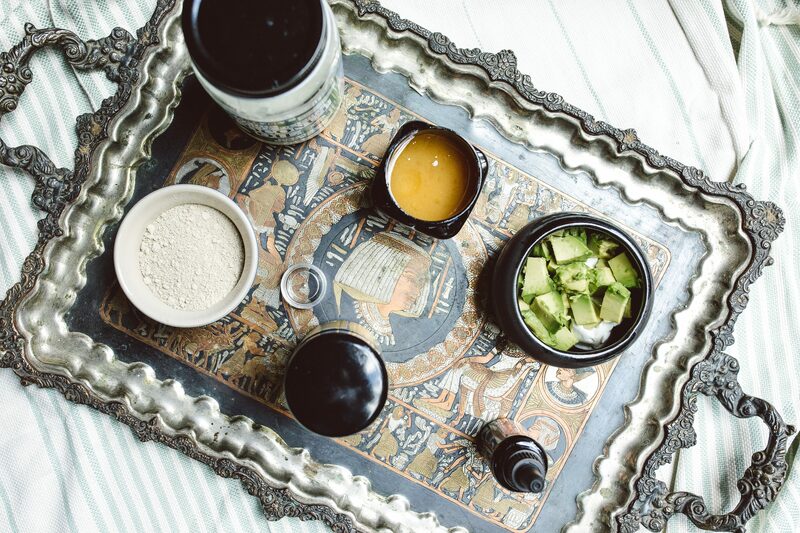 Do you feel that having all these kind of potions topically absorbs in your skin? Ashwagandha and He Shou Wu are the two that I found out that work best. Turmeric is the most amazing thing. It’s super clarifying for your skin, fortifying and it goes back to lifting those little bits. The turmeric mixed with mud together is really clarifying. 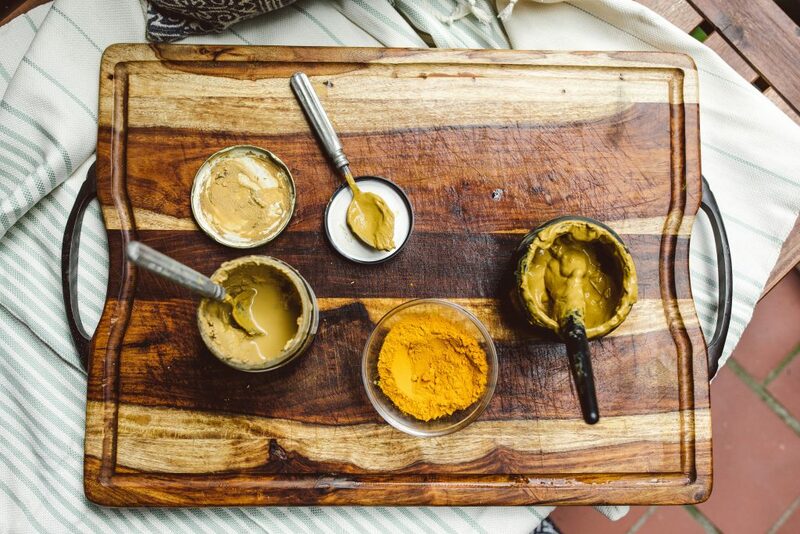 When I was little and I was begging my mom to get Body Shop masks and she’d make me these turmeric masks. What is the best advice your mother gave you when it came to your well-being? One of the earliest tips I adopted from her is to drink hot water with lemon as soon as you wake up in the morning. 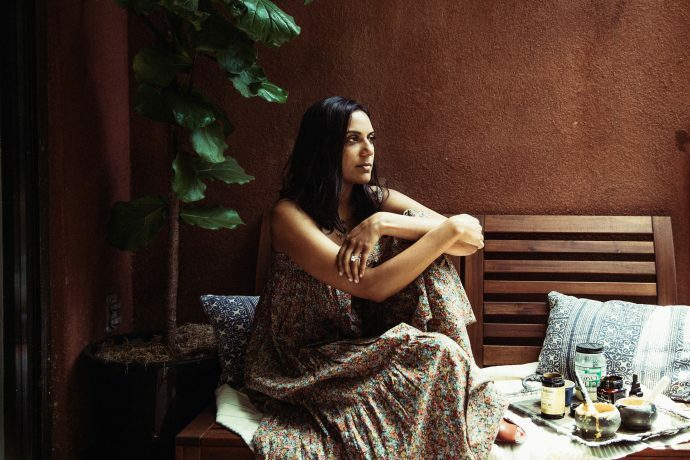 I joke with my mother that she could have been the ultimate wellness guru because she’s been practicing yoga, mindfulness and Ayurvedic medicine since before I was born. 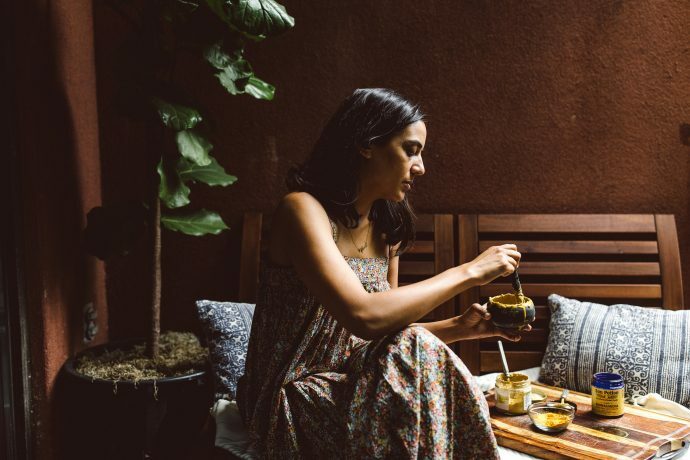 She grew up in India, where these practices are very common, and then worked at Stanford Hospital for twenty years and so she’s always had her own blend of eastern and western modalities. She only speak in absolutes so I just agree with her and do exactly what she says. When it comes to yoga, she’s like, “Yoga will cure everything.” She is also a firm believer in stabilizing body temperature – something I’m still working on. She keeps telling me my body is too hot, and that I should eat greek yogurt to cool it down. With all your travel for work, what are your travel musts and tips for maintaining your skin and well-being? I’m pretty religious about my water intake, taking daily vitamins (goop’s “Why Am I So Effing Tired” is magic) and my skincare routine, but honestly, it all comes back to balance. I’m in LA for almost half the month, and it’s tough to keep healthy habits when you’re going out for dinner every night, so I overload on all of the good things I can get my hands on during the day. I take a ginger, turmeric and cayenne pepper shot and drink a turmeric latte with almond milk every morning, and have a big kitchen sink salad and a Kombucha at lunch. What are your favorite self-care spots? The Shibui Spa at the Greenwich Hotel is one of my favorite places in New York City. Even the tea service is chic. If you can, get a tour of the Axel Vervoordt-designed penthouse at the hotel after. For regular maintenance, I get a facial at Heyday every month; they only use clean beauty products. I also go to Lauren Abramowitz at Park Avenue Skin Solutions – she’s a genius. For a good detox, I do a 60-minute infrared sauna session at Higher Dose; it’s so cleansing and it gives your skin this amazing sun-kissed glow. I do a lot of yoga. I go to Modo. I go to Y7. I like Yoga Vida. I love a hot yoga. That’s like my stress relief. But I also love Soul Cycle. Everyone’s like, “Oh my god. You’re still doing Soul Cycle?” I love it. What was your childhood diet like? We grew up eating mostly vegetables. 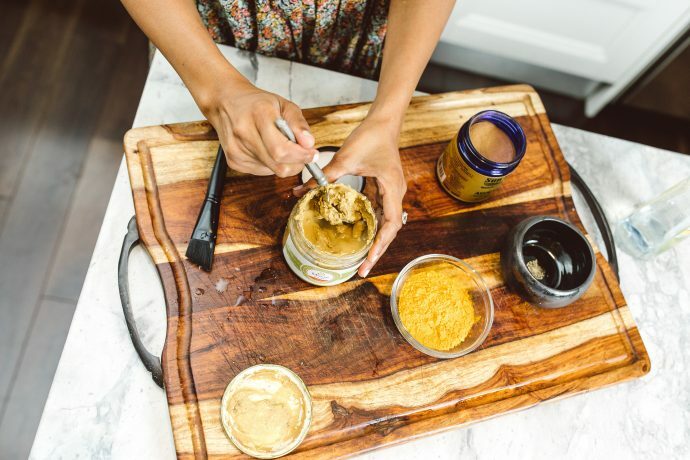 When I was little, we’d always have a jar of turmeric pickled ginger on the counter and we’d eat it as a snack. My friends thought it was bizarre. We also weren’t allowed to eat sugar or white bread, which was revolutionary, even in California, at the time. She also makes the best Indian food. It was a lot of spiced okra and dals. My mom makes the best spiced okra. You have to make sure it gets super crisp on the stove and then you put a ton of spices like cumin and turmeric. You basically give it as much flavor as possible. It tastes like you’re eating candy. You have a charcoal filter in your home, what do you use it for besides making masks? 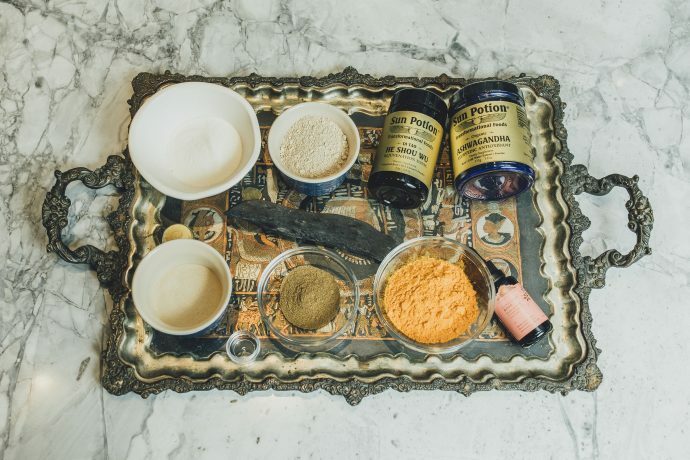 It’s a stick of charcoal that you activate by boiling and then you can use it for three to four months to do anything from acting as a natural Brita filter to shaving it a bit off to put in a face mask. I sadly don’t have a bathtub, but sometimes I bring an activated stick on vacation and drop it in hot water to take a super detoxifying bath. The branches are so pretty too that I don’t mind them sitting out on my cutting board. What are your top 5 clean beauty hero products in your vanity? Goop Luminous Melting Cleanser – I used to hate the dry, tight way my skin felt after washing my face. This waxy cleanser is super moisturizing, while still strong enough to melt away the day’s dirt and makeup. Goop Enriching Face Oil – I still slather this on twice a day, sometimes three. It makes your skin ten times softer within ten minutes. I don’t wear a lot of makeup, and tapping a little of this on before dinner is my secret weapon: it instantly makes you look refreshed and dewy. French Girl Organics Eye Oil – I wasted a considerable amount of my 20s before I learned the old beauty editor mantra, “pat, don’t rub.” The rollerball applicator makes this so easy to use and it distributes evenly, leaving you with only a few seconds of patting time for it to absorb. Naturopathica SPF Moisturizer – People say sunscreen is supposed to be your first clean beauty conversion, but I’ll admit that I just switched mine over permanently. I’ve tried pretty much every natural sunscreen I could find, but since my skin is darker, and most of the natural formulas are white, it’s tough to find one that doesn’t leave a white tint. This Naturopathica one is weightless and absorbs almost instantly. If you want more SPF, Ursa Major also makes a great one. Vintner’s Daughter – I’m not exaggerating when I say everyone at Goop is obsessed with this product. Our beauty director Jean Godfrey-June, told me she uses it instead of retinol and since her skin always has this gorgeous permaglow, I decided to do the same. It feels so nourishing and smells heavenly, but it’s actually super exfoliating; it has over 22 active botanicals. The one caveat is that if you have skin that is on the drier side, it’s best to use this only once or twice a week since it’s such a potent formula. When I first bought it, I slathered it on my face twice a day and quickly learned my lesson.